Benjamin Franklin's Ode to Blackbeard! 1719: A sailor's song believed to be penned by Benjamin Franklin, at age 13, upon learning of Blackbeard's death. Will you hear of a bloody Battle, Lately fought upon the Seas, It will make your Ears to rattle, And your Admiration cease; Have you heard of Teach the Rover, And his Knavery on the Main; How of Gold he was a Lover, How he lov'd all ill got Gain. When the Act of Grace appeared, Captain Teach with all his Men, Unto Carolina steered, Where they kindly us'd him then; There he marry'd to a Lady, And gave her five hundred Pound, But to her he prov'd unsteady, For he soon march'd of[f] the Ground. 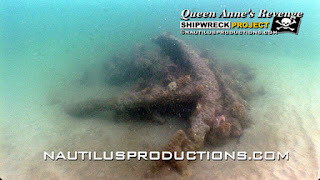 The main pile on the Queen Anne's Revenge - Blackbeard shipwreck site as it appeared in 2008. Anchor A1 (foreground) has been recovered and is in conservation with many of the ballast stones beneath it having been removed. From the Nautilus Productions LLC stock footage library. WATCH THE VIDEO! 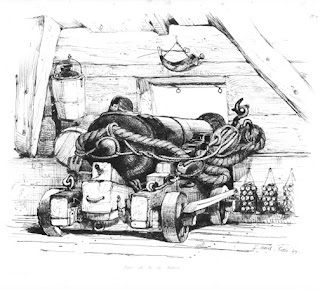 February 1717: Records of the time indicate the HMS Scarborough, a 32 gun fifth-rate British warship, was in the vicinity of Blackbeard and his pirate crew near Nevis. 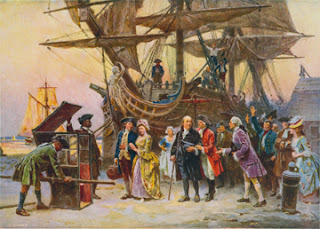 The deposition of Captain Henry Bostock recounts that the pirates "had met the Man of Warr on this station, but said they had no business with her, but if she had chased them they would have kept their Way." No battle occurred. Representative image. http://nautilusproductions.com/projects/queen-annes-revenge.